"With a media cloud following him, Froome is unlikely to have an ideal Tour preparation, no matter which warm-up race he chooses..."
Long the reserve of a minority of fanatics, road cycling has grown into mainstream popularity in the UK. The exploits of the likes of Chris Boardman and David Millar paved the way for the explosion of Team Sky, Bradley Wiggins, and Chris Froome, turning cycling from a niche pastime into an established sport that is followed, and bet on, by an increasingly large body of fans in Britain. For many in the UK, though, cycling remains a once-a-year event: a chance for a daily escape to the diverse countryside of France, with the funny lot from the ITV commentary team as your Tour guides, as you try to get to grips with the meaning of it all again. Previously hard-won knowledge is forgotten from the year before, and you must re-begin, unravelling the code, discovering what the peloton is, why a breakaway is allowed to break away, and why there are a bunch of guys racing whose sole job seems to be to carry food and drink to other member of their team, acting as glorified bi-wheeled waiters. In this series about How to Win On The Tour De France, we'll brush up on the key points. Consider it revision, to get you ready for the exam which starts on Saturday 7th July (and lasts for three weeks). To kick off, we're going to look at the main warm-up races, and what they can tell us about the likely contenders in July. Accepted wisdom runs that, if you want to win the Tour De France, you avoid the Giro. The last rider to successfully complete the double was Marco Pantani in 1998, and there have been some high-profile failures since. It was a surprise to many, then, when Chris Froome announced that this would be his target in 2018. 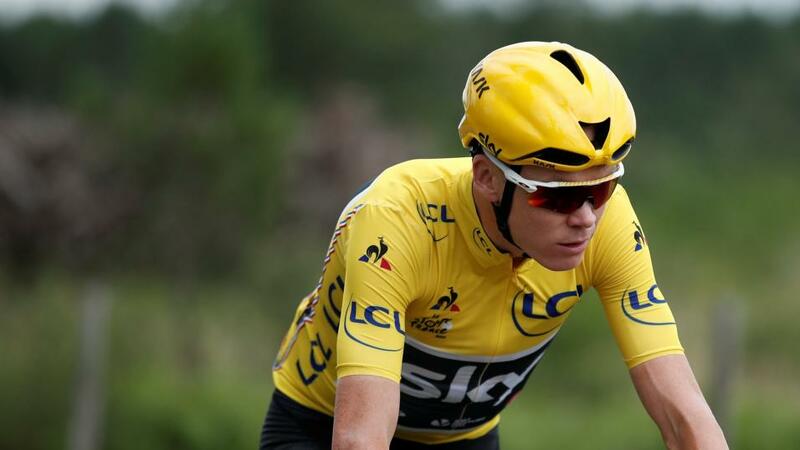 Although the pre-eminent Grand Tour rider of recent years, it was assumed that Froome, and Team Sky, were only interested in the Tour de France and cementing Froome's place in its history books by picking up a record-equalling fifth win in the race. Racing the Giro did not seem to sit well with that aim. But he is committed to the Giro in 2018, which starts in Jerusalem on Friday with a short, individual time trial. And he's favourite, too, at around [3.25], despite facing a stellar field including last year's winner, Tom Dumoulin ([3.55]), Thibaut Pinot ([8.40]), Miguel Angel Lopez ([8.40]), Fabio Aru ([15.00]), and several other riders for whom a solid case can be made. What's clear is that this will be no easy Grand Tour victory for Froome. Dumoulin shed doubts about his high-mountain credentials in the race last year, has reportedly solved the gastro-intestinal issues he experienced so publicly last year too, and increasingly looks like the complete Grand Tour package: able to best Froome in the time trails and stick with him on the climbs. So Froome will need to be at or near his best to win the Giro, which means he will have to rest, recover, and peak again in time for the start of the Tour less than six weeks later. Perhaps that's why Froome is as big as [5.00] to win the Tour de France, behind his old team-mate Richie Porte ([4.70]) in the betting. Punters will have in mind the failures of Nairo Quintana last year - who won neither Giro or Tour - and Alberto Contador in 2011 and 2015, who won the Giro comfortably both times, before bombing in France. It is often unwise to pay too much attention to these kinds of historical trends, though, and perhaps this is a case in point. It's true that Pantani was the last to achieve the double, but then Lance Armstrong wasn't a fan of the Giro, never used it as a warm-up race, and so skews the results. And the failures of Quintana and Contador have some other, compelling explanations. Quintana has always displayed a whiff of inconsistency, Contador arrived at the Tour in 2011 under a banned-substance controversy, and by 2015 he bumped into a Froome at his peak. The fact is that no rider has attempted the double with Froome's credentials. His Grand Tour CV is unmatched, and the team around him, led by his coach, Tim Kerrison, seem to now have a precise understanding of how to get Froome into peak condition when needed. If anyone can use the Giro as an effective warm-up for the Tour de France, then it's Chris Froome, and the reported €1,400,000 that he is being paid for riding the Giro - which, it should be said, has been denied by race organisers - may have made his race scheduling decision-making easier. If he can compartmentalise his own banned-substance controversy, is allowed to compete in the Tour by the sport's governing body, and isn't worn-down by the constant media scrutiny, then he can perhaps do it. Organised by the same company that runs the Tour de France, the Dauphiné has become the warm-up race of choice for Yellow Jersey hopefuls. The route often includes previews of parts of stages that will feature in the Tour - for example, stage six of this year's Dauphiné is effectively a dry-run of the upcoming Tour's stage 11 - and teams use the race both as a final tune-up for riders, but also as a chance to test that their systems and processes are in place (and work) before the real action starts. Because of this, the Dauphiné was used by Lance Armmstrong and his team prior to all his "victorious" Tours, and has become the preferred route of Team Sky, too, with both Wiggins and Froome using it in the past as a springboard to Tour success. On the bare statistics alone, then, the Dauphiné looks the best indicator of who will go on to Tour success - every "winner" (if we ignore subsequent disqualifications) going back to 2002 rode in it. This year, the Dauphiné will be a quieter affair, which will suit (last year's winner) Jakob Fulsang, Vincenzo Nibali and Bob Jungels, all of whom are reported to be on-course to use the Dauphiné as their Tour warm-up. If Froome, or any other Giro wannabees, are not fully recovered from their Italian exertions, then Fulsang and Nibali both have the ability to make their more conservative preparation strategy pay off in the Tour. Andy Schleck, who was awarded the Tour in 2010 after Contador was stripped of the title, is the only rider to have used the Tour de Suisse as a "successful" Tour de France warm-up race in recent history, and it is unlikely the race will provide too many clues this year as to who will wear the Yellow Jersey in Paris. Not that anything precludes it from being an effective warm-up race. This year it includes a team time trial on the opening day - perfect for teams wanting to hone their skills for stage 3 of this year's Tour de France - two hefty mountain stages with summit finishes, and concludes with a 34km individual time trial that would be ideal preparation for the Tour's stage 20. The Tour de Suisse, though, is more likely to continue its tradition as being the proving ground for future stars. This year there is a lot of talk about Marc Soler, a 23-year-old who is set to be Movistar's next star GC-contender, but whether he yet has the experience to convert a strong performance in Switzerland to a win in France is doubtful. Last year's Tour de Suisse winner, Miguel Angel Lopez, will again be in Switzerland, and is being touted as a possible Tour de France contender, too. However, it is likely he will play a supporting role to whoever Team Astana choose as their main Tour de France hope this year. The least popular choice of Tour de France hopefuls, the Route De Sud, a short stage race in the Pyrenees, has become more high-profile in recent years as Alberto Contador and Nairo Quintana have both used it (so far unsuccessfully) to round-off their Tour preparations. Quintana, who seems to shy away from orthodoxy when it comes to Grand Tour preparation (he likes to return to his home in Colombia rather than joining the European pro-cycling scene) used the Route De Sud as a warm-up to his Tour White Jersey in 2015, and again prior to his 3rd-place in Paris in 2016. The Colombian has followed a quiet schedule in 2018, solely targeting the Tour de France, and may well use the Route De Sud this year. If Froome is unable to recover from his Giro exploits, a fresh Quitana will be able to benefit in the Tour. What does it all mean for the Tour De France? Historical trends of these sort, in any sport, are usually unreliable. They are based on small data sets and fail to recognise that each year presents a new set of circumstances that are far more significant in determining outcomes than any historical pattern may be. What does seem clear is that winning the Tour de France requires long-term planning. You can't turn up in France as an afterthought and expect to be at your peak. A rider's schedule needs to be carefully planned so that their body is ready, and this needs to be allied with months of prosaic preparation too: reconnoitring routes, booking the best accommodation, and making sure the support staff are ready to perform their roles optimally. Let's say, for example, that Dumoulin wins the Giro and decides he may as well take a tilt at glory in Paris. Well, he'd be one to oppose. Even if he could get himself attuned physically, there would be some crucial point in the race - think Froome's surprise downhill attack on Stage 8 in the 2016 Tour - where a lack of team knowledge would see things unravel against better-prepared rivals. And that may be Froome's problem, too. All the debate has been around his physical preparation - whether he can recover and re-peak or not - but more significant may be his level of practical preparation. YouTube videos attest to the time Froome and Team Sky has spent reconnoitring key stages in Italy. Does this mean that their usual scrupulous attention to Tour detail will be lacking in 2018? Perhaps, perhaps not. But with a media cloud following him too, Froome is unlikely to have an ideal Tour lead-in, no matter which warm-up race he chooses.